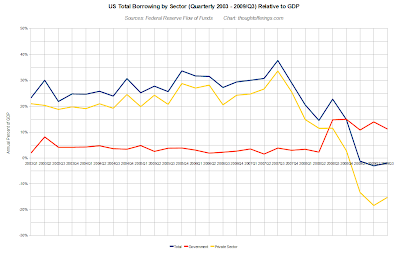 The latest Federal Reserve Flow of Funds report shows a rough continuation in Q3 2009 of the Q2 trends in borrowing. However, the big news is that it has become clearer that the private sector's negative rate of borrowing has stopped increasing and has stabilized at a level roughly opposite to the government's positive rate of borrowing. Steve Keen often discusses the "debt contribution to demand", i.e., borrowing adds to total demand and reducing debt subtracts from it. 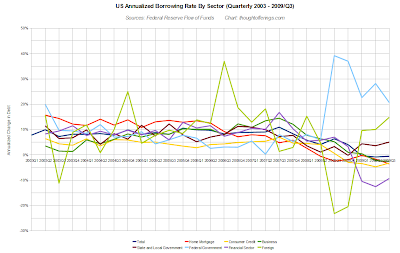 This stabilization in the rate of total borrowing (and its associated spending) since Q1 likely is one of the larger factors in the stabilization of GDP in Q2 and Q3 from a state of freefall (see graph on right). But see the following caveat on how this conclusion could be flawed. 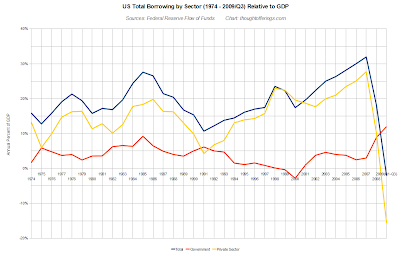 This data is a somewhat crude proxy for debt's contribution to demand in the sense that some government borrowing (e.g., TARP) goes to propping up balance sheets rather than supporting spending on goods and services and thus incomes. Similarly, private debt contraction is still dominated by the financial sector, the debt of which likely has a less direct correlation to GDP-related spending than does household credit, for example. Perhaps I will try separating these in a later post, but it may not be feasible to do well. 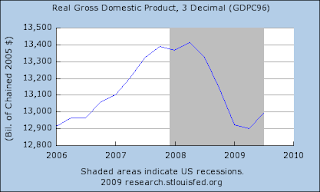 One of the reasons why treasuries have no trouble finding buyers (more details in posts here and here) is that in a balance sheet recession, public debt simply fills the "hole" left by disappearing private sector debt. Will this deadlock hold in future quarters? There are several possible scenarios that I still plan to cover in a separate post. A negative one of non-trivial probability is "double dip" recession with re-accelerating private debt reduction unaccompanied by sufficient public sector borrowing to offset the falling demand and therefore GDP. In another scenario, if the current "deadlock" were to continue as is, there would no longer be the ongoing annual increases in debt that have added to aggregate demand over recent decades (a point often emphasized by Steve Keen). This would imply a much lower level of annual growth in GDP than most expect, and is closer to the Japan outcome than the Great Depression outcome. 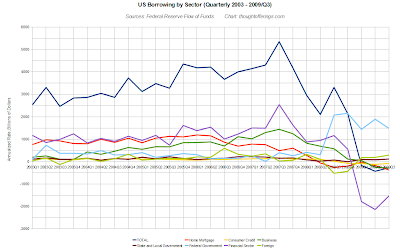 UPDATE: Replaced corporate debt with business debt (a broader category) in two charts.